If I remember correctly my 2015 gift arrived in june 2016. I think we got the 2017(or 2016?) QC gift (the yesstyle coupons) in spring as well. Last year's gift though (the infamous Large T-shirts) had arrived sooner if I remember correctly, that's why I asked. Oh well... Maybe they're preparing something better this time that needs some more time. I guess we'll find out. We're happy to hear you're looking forward to this year's QC gift! At this time, we're still putting together the gifts and finalizing mailing everything. We thank you so much for your patience, and we'll be sure to send out another message once all QC's gifts have been sent out. Thank you again for everything you do on Viki! 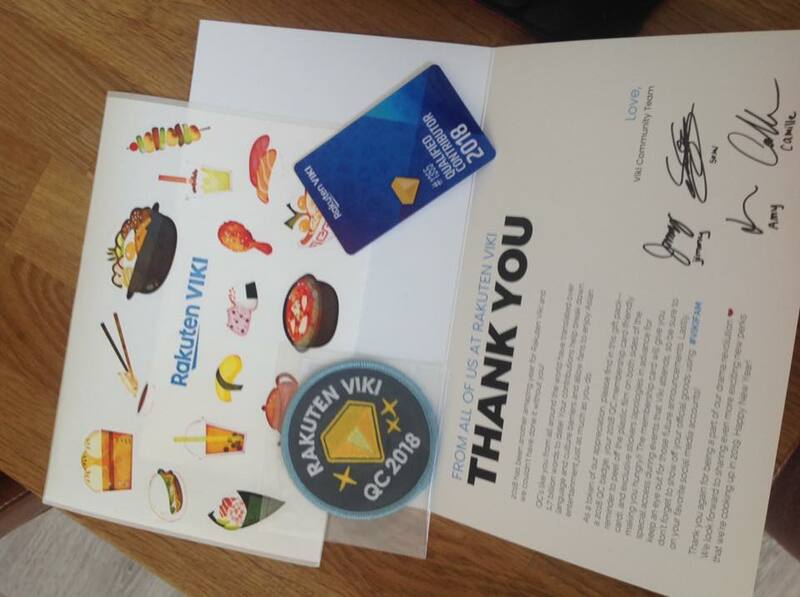 @camiille I didn't receive the last community email / announcement with the "guess" the picture, I think it was about rewards, some other German viki members did not receive it as well. Should I reopen the previous topic in bugs & issues again?? That's odd, thanks for letting us know. Please feel free to PM me directly if you'd like to share the list of German users. I can then pass that along to the appropriate team member. Otherwise, normally for other bugs I'd post them to Bugs & Issues. Also please let me and the German Community know when the translations will be done of About and Title in my case The Story of Ming Lang that started airing on December 25 last year. The 2 answers I received about posting shortly is not happening. I thought Viki is all for Global viewers, another issue I have, why is on my English page in my Channel Role page saying "Deutsche Subtitler and Deutsche Moderator" it's a page all in English and not German, therefore it should state in Englisch: German Subtitler and German Moderator... this must me some mistake... there are other things I addressed but it's probably a question of time to have that fixed. Thanks for reading and I just will reopen the thread, so others can add their name... who have the email issue. updates 1/27: the translation on Ming Lan has been now posted, but why so many short paragraphs?? It's not just German, @simi11 dear. It's ALL the languages asides from the 10 languages which you can find at the bottom of Viki's homepage. Hopefully everything gets restored and improved ASAP. Hi, someone has already received the QC gift ? . I got mines around March last year but it depends where you live! This was the gift as received by another Italian mod who posted it on Facebook. The tote bag, I gave to another Viki German subber that time, who didn't get anything because it was her first year. Well at least a tote bag could be used. And it wasn't made of plastic. I wonder is that the normal or gold QC gift?